This review is written for consumers interested in finding out more information on Focal Point. This drug is designed for people searching for methods of enhancing their cognitive functions that would allow them to become more productive throughout the day. It is meant to work as a booster for memory capacity, learning ability as well as increasing concentration while lowering the possibility of being easily distracted. 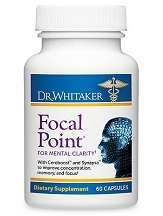 Focal Point can be ordered online as it is not a restricted drug. The formula is based on a mixture of natural ingredients that are proven to improve the overall mental performance. These compounds of natural origin create an improved cerebral environment which will allow the user to think and learn faster and stay focused for extended periods of time. The user is instructed to take no more than 2 capsules on a daily basis. The two pills can be taken as one serving or split into two dosages to keep a more constant effect throughout the day. The starting price for one bottle is 34.99$ but customers can benefit from various special offers and discounts. For example, clients have the option of ordering 3 bottles and receive one more for free or order 5 bottles and receive 2 of them for free. Additional discounts are available if clients opt for the AutoDelivery payment method. This involves a subscription type of payment that would renew the order on a monthly basis whenever the customer chooses. With this method, there will be a 10% discount from the original price and shipping fees will be handled by the manufacturer entirely. I used Focal Point for over two months hoping to improve my memory and ability to learn faster. In the first week there were no positive results other than a slight improvement in focus. It took more than three weeks to experience a slight increase in memory capacity, but it did improve after more than a month of regular usage. The drug does have an effect but the reactions take a lot longer than described. Side effects are not known for appearing during this treatment. The product is a blend of a few vitamins and herbal extract that should not cause any kind of harm to anyone taking it for short or long periods of time. According to the manufacturer, if the product does not meet the customer’s expectations he may return it for a full refund within a 90 day period. The reason for the return doesn’t matter as any product is eligible for financial reimbursement if the consumer is not fully satisfied with the results. Reviews are available on the supplements webpage and the majority of them seem to be highly positive. Some customers do complain, however, that they have not experienced any kind of improvements even after several months of treatment. Focal Point is a risk free drug that can easily be purchased without a prescription. This product can be acquired by benefiting from various discounts made available by a manufacturer who also backs it with a well established guarantee. Some reviews, however, are raising questions as certain customers complain about the drug being ineffective. The formula is also seen by some rather lacking due to a small number of ingredients when compared to other similar products.